Agriculture is one of the company’s basic sectors. 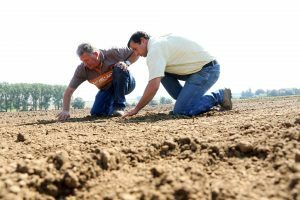 To get the most out of the rich land in Hesbaye and Condroz, Hesbaye Frost works with the cooperative APLIGEER and its five hundred farmers who cultivate no less than 7,000 ha in total. 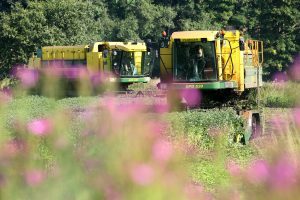 Historically, peas have been the company’s development stalwart, but Hesbaye Frost has diversified its production, mainly through the research and innovation section of its agronomic department. The agronomists’ current challenge is to achieve “zero residue” active ingredients in its productions. Despite advances in technology, farming remains in thrall to Nature, which dictates its law and itself fixes the harvest start and end points. Agronomists can, of course, use their knowledge to organise the flows in optimum fashion. The harvest is the link between the land and the factory. 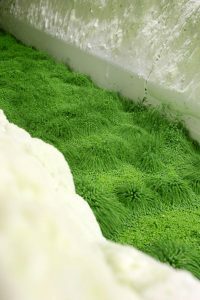 It is the period when the factory must focus on what is happening in the fields so that the vegetables are processed in the shortest possible times. The organisation must be perfect. 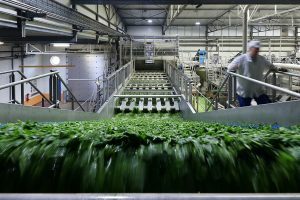 The machinery works flat out to supply the factory constantly with produce ready to be processed and deep frozen. 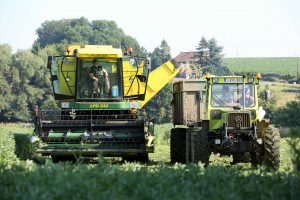 The harvesting machines play an important role in product quality. When they harvest the peas, they attempt to leave the pods in the fields. For beans, they avoid transporting the stems, etc. This makes the work easier in the factory and avoids transporting materials needlessly. Between the harvesting machines and the factory come the carriers. Some are traditional and others are brought in as reinforcements during peak periods. The itineraries between the fields and the factory are designed to avoid travelling through villages, even if this extends the journeys slightly. The products must be transported in the best possible conditions. Broad beans are therefore conveyed in water to avoid oxidisation. Once at the factory, the products are washed initially with fresh water. This also involves removing all foreign bodies – pebbles, stems, branches, leaves, etc. – to make the product as clean as possible. This means combining various techniques: floating baths for pebbles, magnets for metal and optical sorters, in increasing numbers, that use compressed air jets to eliminate anything not seen as the product. But above all it is the operators who are there to check that all the settings are correct, who supervise everything and get the most out of the machinery. 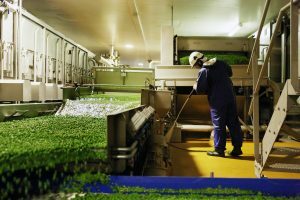 Only once everything is in order does the product move into the blanching phase: it spends an average of one minute in water at 90°. These two parameters (time and temperature) can vary from one vegetable to the next. This step renders the alteration enzymes inactive. It prevents subsequent oxidisation, fixes the colour, avoids the loss of vitamins and maintains the nutritional components. Then comes the deep freezing tunnel. Here speed is of the essence. The vegetables are thus confronted with winds at -25°. To protect the product structure as much as possible, the passage through the cold must be as intense and as short as possible. Last preparation step: calibration. Certain vegetables are sorted by size to meet customer demands. The customers are going to place their orders as the year goes on. Hesbaye Frost must therefore store the stocks temporarily. 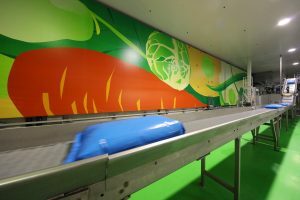 The produce is stored in a cold room at a temperature of -22° until packaged. Although there is no average timeframe, the principle is to keep sufficient stock between two seasons, but certainly no more. The goal is to empty the last storage bin before the new harvest. 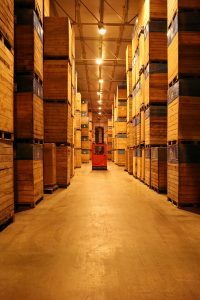 To make the most of the storage areas, the teams include fork lift operators capable of stacking bins up to 10 m high. The seven packing lines can package products in 100 g to 25 kg bags as well as in cardboard containers from 100 kg to 1 t.
The factory also has a blending line that packs into large containers (over 100 kg) by mixing different products. Quality controls are, of course, instigated before, during and after packing. They use a variety of techniques as well as human inspection. Traceability is key. It identifies the original plot for all products at all steps in the process. Once packaged, the products are placed on pallets, shrink-wrapped to keep them rigid during transport and labelled again. They are then stored temporarily in Fridge 7 ready for shipment. 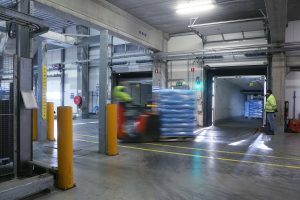 In operation since 2014, Fridge 7 is capable of storing 30,000 pallets. Highly automated, it uses cutting-edge technology with minimum energy consumption. It has been designed to facilitate product shipments. This operation becomes even more significant knowing that over 85% of products are intended for export.